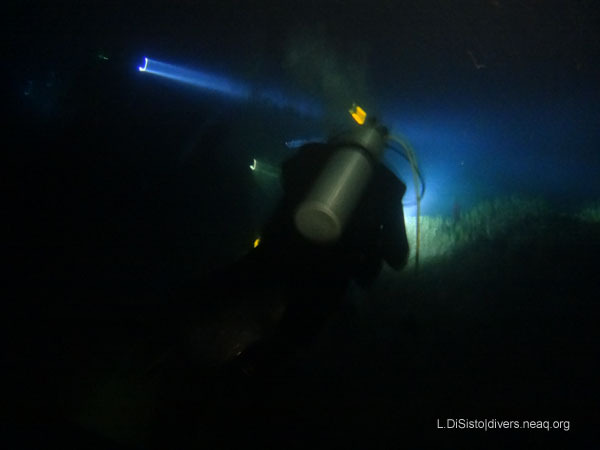 This guest blog about scuba diving at night was written by former Dive department intern, Luigi DiSisto (left). 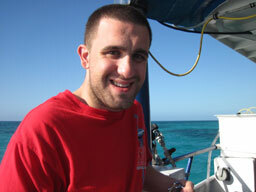 Stay tuned for more posts and pictures from expedition participants and staff diver Chris. When most people think of scuba diving in the Bahamas, the first thing that comes to mind is definitely not pitch black water and being unable to see two inches in front of your face. However when you jump in the water at 9:00 at night, it is a totally different world than during the day. There are many different types of animals and animal behaviors, and it is a completely different experience overall. 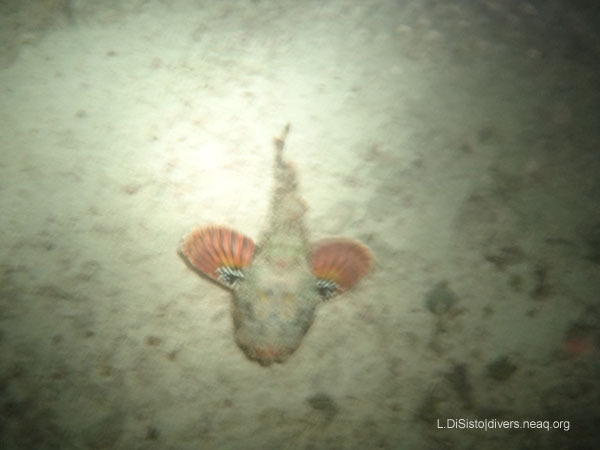 This was my first night dive and I was SO excited for it! As soon as I jumped in, I knew it was going to be a memorable experience. As I started to descend, I felt a little bit disoriented at first. Being surrounded by blackness made it a little difficult to know which way was up and which way was down. As soon as I flicked on my dive light, I was good to go. I descended to a maximum depth of 36 feet in the beautiful 79 degree Fahrenheit Caribbean water. My dive lasted 42 minutes, and during that time, I experienced some pretty amazing things. I apologize for the quality of my pictures, but it is difficult for a camera to focus with no light. 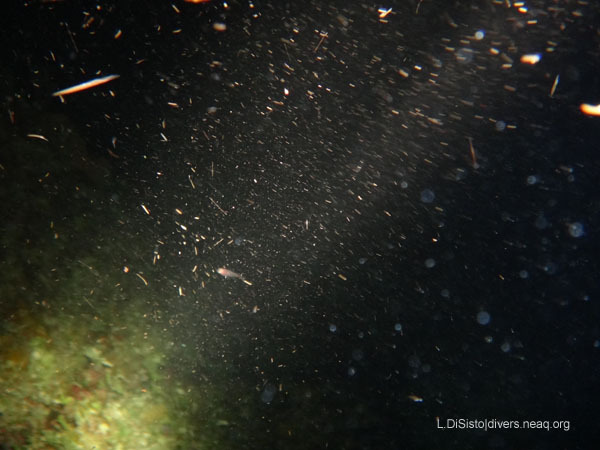 As soon as I turned on my dive light, I attracted a lot of plankton. Having all of this plankton swarm around me was really a wild and very different experience in and of itself. As I approached the reef, one of the first things I saw was a few Sea Urchins and a Spiny Caribbean Lobster! This was so cool because during the day, these animals are hidden in rocks and coral, but by SCUBA diving at night, you get to witness all of them out and about. 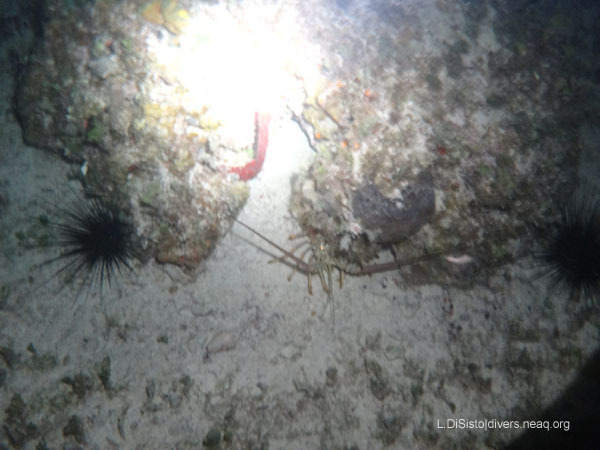 Spiny Caribbean lobster and sea urchins out and about at night! One of the fish that I learned about on this dive is called a scorpionfish. They are in the family Scorpaenidae, which also includes the lionfish and the stonefish. The beautifully colored fins on this rather ugly fish carry very potent venom. If stung, a person will immediately feel intense pain and have extreme swelling of the area that was stung. Within minutes, a person could experience blood pressure changes, delirium, fainting, heart rate changes, nausea, shortness of breath and even seizures or paralysis (just to name a few symptoms). 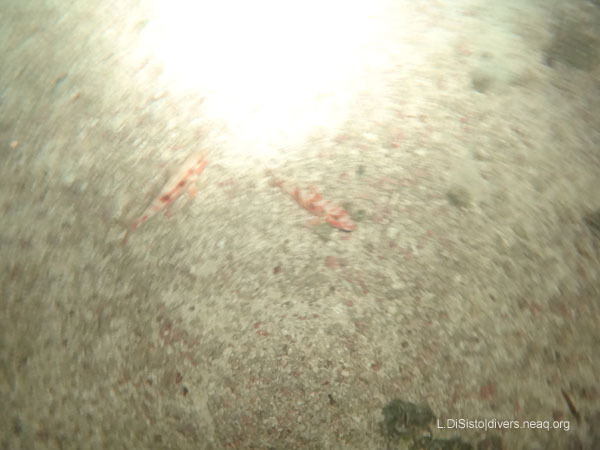 I saw three scorpion fish on this dive, thankfully, all from a safe distance! Now just because we were diving at night, definitely does not mean that the Aquarium’s dive team wasn’t still hard at work collecting fish! One of the types of fish that we were targeting at night was parrotfish. Parrotfish have a very unique biological feature that made them much easier for us to catch at night. When it gets dark out, parrotfish will form a cocoon made of mucus around their body and this adaptation will typically help them in avoiding predation at night. When they are in this cocoon, they don’t move around very much which made it much easier for us to catch these very speedy fish. At the end of the dive, Captain John even accidentally brought up a starfish. 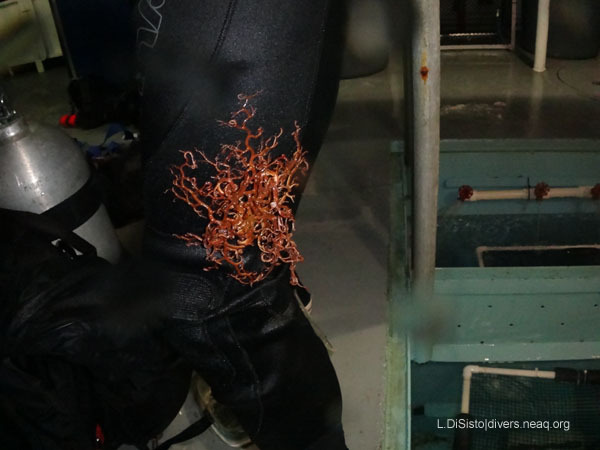 Just to give you an idea of how bizarre some of the animals were that we saw on this dive, here is a picture of the starfish that came up attached to Captain John’s leg! Overall, the night dive (as well as the entire expedition) was an unforgettable experience to say the very least. I enjoyed every minute of every day on the R/V Coral Reef II and look forward to joining the Aquarium again in the future!